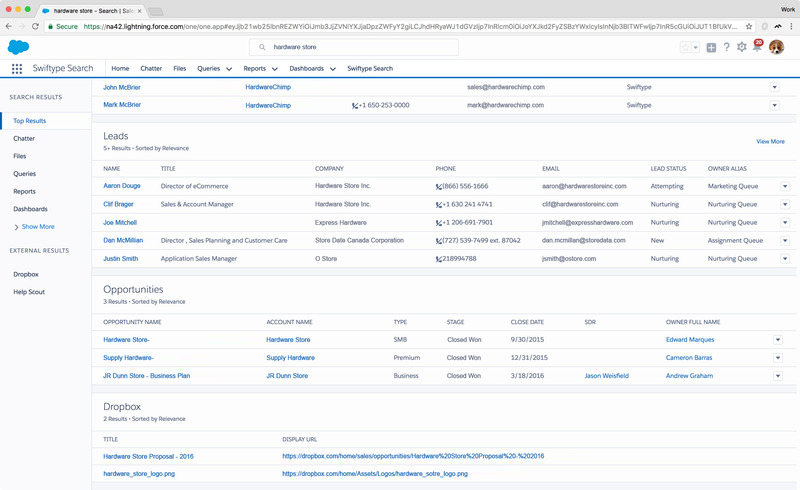 SAN FRANCISCO, Aug. 25, 2017 (GLOBE NEWSWIRE) -- Swiftype recently announced a new integration between Salesforce Federated Search and Swiftype Enterprise Search, providing Salesforce users the ability to find and access content where it lives—in Dropbox and Google Drive directories, Confluence spaces, JIRA issues, Slack channels, Gmail conversations, and many other disparate sources—without ever leaving Salesforce. 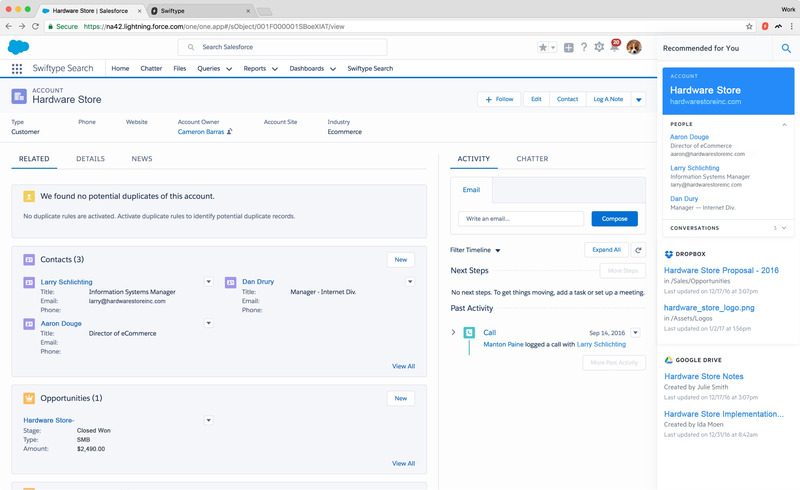 Customers benefit from the addition of Swiftype’s artificial intelligence (AI), natural language processing (NLP), and machine learning (ML) technologies into Salesforce Federated Search. These technologies help identify a user’s true intent for every search, applying refinements automatically, and returning only the most relevant search results. 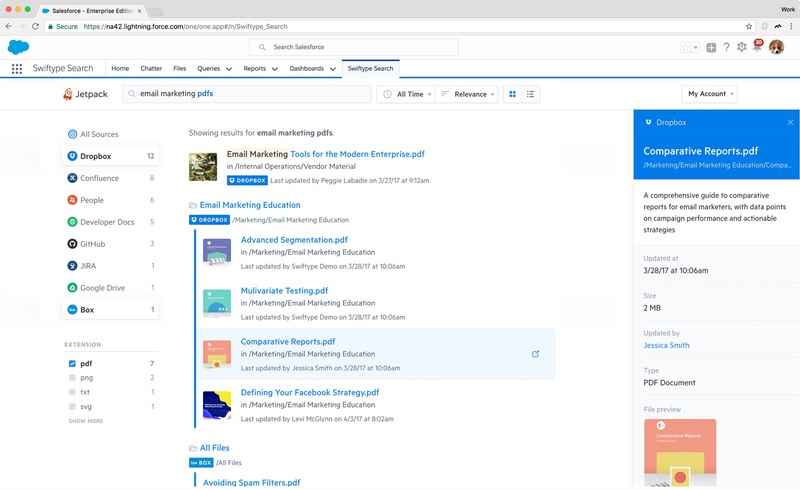 Swiftype’s integration with Salesforce Federated Search lets employees search once and see results from all their content sources in the same results page. Swiftype’s backend technology understands search queries and prioritizes content sources based on the queries text itself, historical search behaviors across the organization, and even the individual’s role and demonstrated preferences. For example, when support reps who work on cases often reference articles or documentation stored in apps like Confluence or Sharepoint, the system learns to prioritize results from those applications. The entire search experience is integrated directly into the user’s existing Salesforce-based workflow, minimizing context switching and resulting in dramatic improvements to employee productivity and efficiency. Get started with Salesforce Federated Search by contacting Swiftype here. More details on implementation can be found on the Salesforce blog here.